We never purchase an iron for its aesthetically pleasing design. Its not one of those appliances that we showcase on a kitchen or laundry room counter. It’s the small appliance that we hide away in a cupboard and often let our ironing pile become rather unruly because of this. When buying an iron, we look for convenient features and something that will heat properly and get rid of all those unsightly creases and wrinkle. The Russell Hobbs 18616 Easy Store Wrap and Clip Iron falls into the category of not being the prettiest iron on the market, but it gets the job done. 2400W bring decent power to the 18616 and it heats up quickly. With its 300ml water tank, you will have plenty of water to steam out those stubborn lines before having to refill. The Iron also comes with an easy to use funnel to fill up the reservoir when you need to. Incorporating 45g/min of continuous steam or 120g/min of shot steam at the press of a button, the Russell Hobbs 18616 Iron delivers plenty of moisture to attack creases with ease. The ergonomically designed sole plate is constructed from scratch resistant stainless steel and has adequately placed steam channels. With a nicely tapered front point, this iron can undoubtedly reach pleats, collars and in between buttons. Easy storage and clean up is a breeze. The 2-meter cord effectively wraps around the heel of the iron and clips into place. No more trying to wrap the plugin around the iron itself. Although the Easy Store Wrap and Clip helps with unsightly cords, the heel of the iron does have some flaws. The stability when resting the iron on its heel while ironing, is quite unsteady. If you have an iron rest on your ironing board this won’t pose a problem at all. With the temperature settings dial placed directly under the handle, it is easy to knock with your knuckles while ironing. The Steam Off switch is also poorly placed and can definitely be bumped while removing creases from your favorite garments. However, the 18616 from Russell Hobbs has legible settings and can dry/steam/spray and steam burst. Those are gadgets that you should always look for when purchasing an iron. This one even has a temperature ready alert so you will know when your iron is at the right temperature for whatever fabric you are ironing. The Russell Hobbs 18616 is lightweight at 1.7kg and has a built in anti drip feature that will save your clothes from unsightly water spots. The self cleaning function keeps your new iron from building up calcium deposits. With a quick change of settings, the 18616 will force any lime scale through the steam holes and clean out any bits of debris from building. This convenient feature will keep your iron healthy and give it a much longer lifespan. Taking everything into account when researching the Russell Hobbs 18616 Easy Store Wrap and Clip Iron, it will do the job. The stainless steel plate isn’t quite as smooth on clothing as other comparable models and the placement of some features are a little lack lustre. 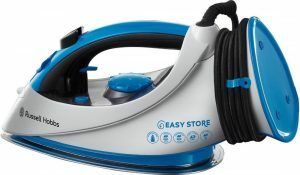 If you are simply looking for an iron that is relatively easy to use and will work for the little bit of ironing you have, this iron may just fit the bill. The Russell Hobbs 18616 Easy Store Wrap and Clip Iron also comes with a 12-month guarantee, so if you are not 100% satisfied, or have any issues, you won’t be stuck with it.